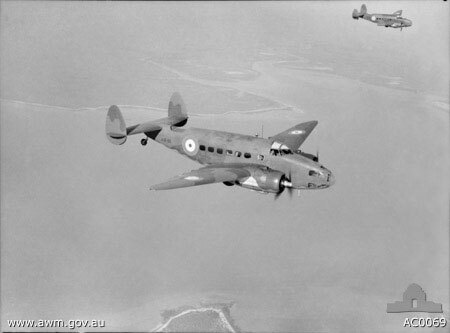 13 Squadron Royal Australian Air Force in flight Darwin. 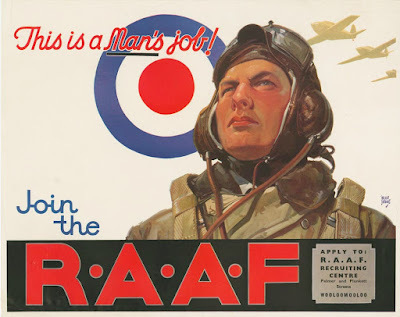 The Royal Australian Air Force (RAAF) played an important role in the Allied war effort. At the beginning of the conflict, the RAAF was a small, ill-equipped, but well-trained force of 3,489 personnel and 146 mostly obsolete aircraft. These included Anson bombers, flying boats, and the Australian Wirraway, essentially a training aircraft that proved totally inadequate as a fighter. When the war began in September 1939, one squadron was en route to Great Britain to secure new aircraft. The Australian government released this squadron to serve with the Royal Air Force (RAF), which it did for the remainder of the war under the auspices of RAF Coastal Command. In this role, the Australian squadron was responsible for sinking six submarines. Other squadrons served under the RAF in the Middle East and in the Italian Campaigns. Although there were 17 formal RAAF squadrons during the war, Australian pilots served in more than 200 individual Commonwealth squadrons. To facilitate air training, representatives of the Commonwealth established the Empire Air Training Scheme. This brought potential pilots to Australia for initial training and then sent them to Canada for final flight school and dispatch to Great Britain to serve in the RAF. The RAAF established several flight schools in Australia for a program that eventually trained some 37,000 pilots. The initial deployment of RAAF assets was to support the war in Europe. Thorough training took time, and it was not until the Battle of Britain was over that Australia's first, and justifiably famous No. 452 (Spitfire) Squadron was formed in April 1941. The squadron soon produced a number of outstanding aces and was commanded by the famous Wg-Cdr "Paddy" Finucane, D. S. O., D. F. c. and two Bars, who welded the unit into a highly efficient fighting team. Such was their success that for the four months from August to November 1941, No. 452 became and remained the top scoring squadron of British Fighter Command. Before this, however, members of No. 10 Squadron had gone to England to take delivery of their Sunderland aircraft, which were to be used for Australian coastal defence. But when war became a certainty, the aircraft and crews were at once placed at the disposal of the R. A. F. As such, No. 10 became the first Commonwealth squadron to go into action in World War II. In the extended see-saw battle against U-boats in the Atlantic, No. 10 scored many noteworthy successes and was later joined by No. 461, a second R. A. A. F. Sunderland squadron formed for similar duties. Perhaps the most startling event concerned a No. 461 Squadron Sunderland piloted by Flt-Lt C. B. Walker which encountered eight German Ju 88 fighters over the Bay of Biscay on 2nd June 1943. In a series of furious attacks lasting 45 minutes, the Ju 88s almost shot the lumbering Sunderland to pieces but they paid dearly for their determination to finish off the crippled machine - three were positively destroyed, a fourth probably destroyed and a fifth badly damaged. The Sunderland, too riddled with bullet holes to carry out a normal landing, crash landed and was destroyed on the beach at Marazion, Cornwall. Today pieces of this machine can be seen on display in the Australian War Memorial. By far the greatest Australian contribution to the air war however, lay in the formation of bomber and attack squadrons consisting of Nos. 455, 458, 460, 462, 463, 464,·466 and 467 Squadrons, all of which took part in the strategic bombing offensive aimed at crippling the vital industries of Germany and the occupied countries under her control. 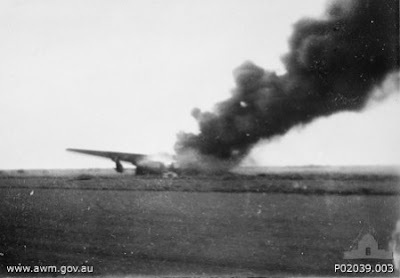 The first Australian units experimented with the development of night bombing techniques later used so effectively by Bomber Command. With many of these units the mortality rate of crews was something horrifying, but nevertheless two machines recorded over 100 missions - Lancasters "G for George" and "S for Sugar", both of which were preserved after the war, the former in Canberra, the latter in England. Although such types as the Hampden, Ventura, Wellington and Halifax were widely used by R. A. A. F. squadrons, there can be little doubt that the famous Lancaster was the outstanding night bomber type of World War II. Lancasters had wings holed by falling bombs, lost elevators and tail assemblies through flak damage, suffered in-flight fires and loss of engines, and yet somehow still managed to limp back home. There is even one account of a No. 460 Squadron Lancaster flown by Flt-Sgt Christensen which was accidentally looped over the Ruhr Valley whilst carrying a full bomb load. It recovered a scant 1,500 feet from the ground, having plunged over 15,000 feet and bending its mainspar several feet in the process. From 1942 onwards further R. A. A. F. fighter squadrons joined No. 452; No. 456 flying Defiant and Beaufighter night-fighters, and after the debacle at Singapore, No. 453 Squadron, now more happily equipped with Spitfires. Changes in equipment were made according to the availability of aircraft and two squadrons - Nos. 456 and 464 - were issued with the versatile all-wooden Mosquito in either fighter or fighter-bomber versions. It was in a Mosquito that the Australian daredevil Sqn-Ldr C. Scherf destroyed fifteen aircraft in the air and a further nine on the ground in the period of sixteen weeks; an eloquent testimony to the speed and striking power of this outstanding aircraft. 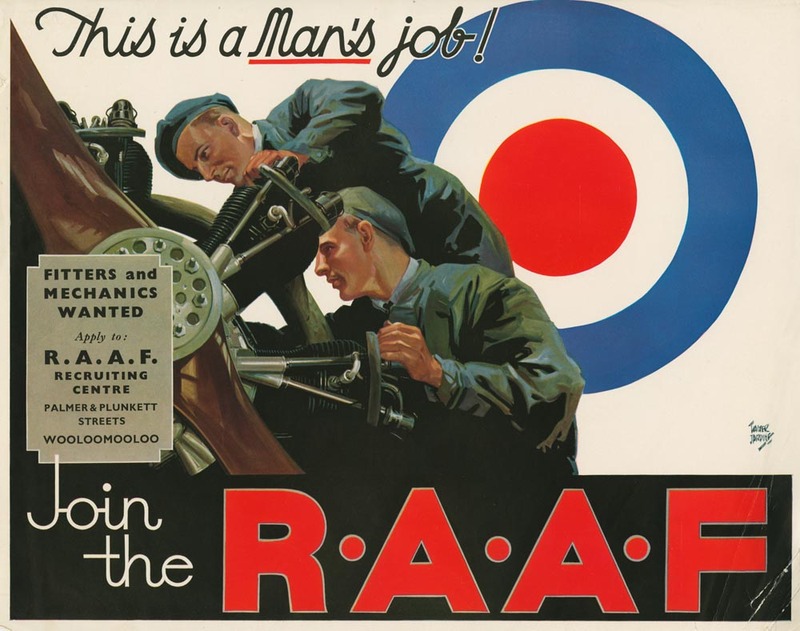 When the war drew to a close in Europe the R. A. A. F. had three fighter squadrons; Nos. 451, 453 and 456; five bomber squadrons, Nos. 460, 462, 464, 466 and 467 as well as three Coastal Command squadrons; Nos. 10,455 and 461. In varying degrees and according to their opportunities all these squadrons distinguished themselves with the sturdy British-built machines with which they were equipped. The entry of Japan into World War II in December 1941 led to a redeployment of Australian squadrons to the Pacific. Japanese military advances and Japan's air raid on Darwin on 19 February 1942 increased pressure for better air defense over Australia. Beginning in 1942, U. S. air units were dispatched to Australia to bolster the RAAF. On 17 April 1942, all RAAF squadrons in the Pacific were placed under the auspices of Allied Air Forces Headquarters, part of U. S. General Douglas MacArthur's Southwestern Pacific Theater command. The RAAF participated in almost every major campaign of the Pacific Theater. Four RAAF squadrons, two with Hudson bombers and two flying obsolete Brewster Buffalo fighters, fought in the 1941-1942 Malaya Campaign. Later, elements of these squadrons were withdrawn to the Netherlands Indies and finally back to Australia. Two other RAAF squadrons fought in the Netherlands Indies before being relocated to Australia. RAAF units distinguished themselves in the defense of Milne Bay in September 1942. Early deficiencies in aircraft were overcome with the addition of P-40 Kittyhawk and Spitfire fighters. The RAAF played an important role in supporting ground operations and in attacking Japanese shipping, including during the Battle of the Bismarck Sea. It also assisted in long-range minelaying operations throughout the war. The RAAF also provided wireless units to its troops who participated in the invasion of the Philippines. By the end of the war, the RAAF numbered 131,662 personnel and 3,187 aircraft. References Firkins, P. Strike and Return. Perth, Australia: Westward Publishing, 1985. Gillison, D. Royal Australian Air Force, 1939-1942. Canberra: Australian War Memorial, 1962. Wyndham, the West Australian coastal town close by the border with the Northern Territory, which was twice attacked by Japanese aircraft in March 1942. The first raid, carried out shortly after 10 a.m. on 3 March 1942—the same day as Broome, Western Australia, was similarly hit— involved eight Zero fighters from Koepang, in Timor. A RAAF DH–84 Dragon navigation training aircraft, which had just landed, was caught on the ground and set alight by strafing. Also set on fire was the airfield hangar and a fuel dump comprising a large quantity of 44-gallon drums which had been delivered only a week earlier. A second aircraft, a Lockheed 10 operating a commercial service for MacRobertson-Miller Aviation Co., had cleared the area just minutes before the enemy fighters arrived and thus escaped being caught up in the raid. The second attack, again focused on the aerodrome, was conducted by seven bombers on 23 March. This saw a chain of about 30 large craters blasted along the runway, but there was no other damage. An hour later three Zeros appeared and made low-level strafing runs, but with little significant effect. 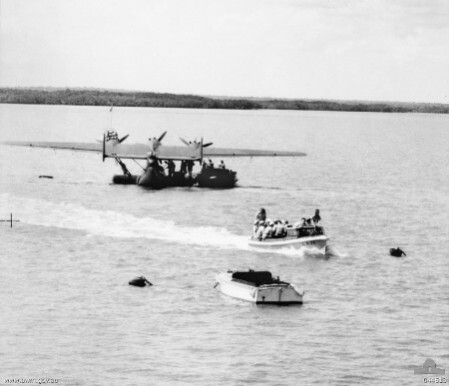 Transporting passengers to and from a Dutch seaplane in Roebuck Bay near Broome, a few months before the attack. Broome, the pearling town on the north coast of Western Australia, was subjected to four Japanese air attacks between March 1942 and August 1943. The first attack came while the limited port facilities were heavily stretched coping with a large influx of refugees fleeing the Japanese invasion of the Netherlands East Indies. During the last stages of this evacuation, flying boats and land planes had been operating a shuttle service from Broome to bring out thousands of Allied personnel and Dutch civilians from Tjilatjap, on the south coast of Java. As a consequence, there were sixteen big flying boats moored in Roebuck Bay at dawn on 3 March—all highly vulnerable in an area only 2,400 metres long and 1,200 metres wide. The appearance of a Japanese reconnaissance plane about 3 p.m. the previous day had been an unmistakable portent that an enemy attack was possible, indeed likely, yet pilots ignored warnings to leave at the first opportunity after daybreak. Only one aircraft—a small float-plane from the American cruiser Houston, sunk two days earlier in the Bantam Bay battle—had taken off from the alighting area that morning before nine long-range Zero fighters dropped down from the overcast at 9.20 a.m. Six of the attacking aircraft, flying in line-ahead formation, swept in from the sea and crossed the harbour entrance at a height of about 500 feet, while another three circled overhead as a protection against opposing fighters (of which there were none). Three of the Zeros concentrated on strafing the moored flying boats, their explosive bullets quickly accounting for every one of them. Several of the trapped aircraft had been almost ready for take-off and were filled with passengers, many of them women and children, who were forced to take to the water. The Japanese pilots showed restraint in not further attacking those thus rendered helpless, or a party of 25 evacuees who were gathered on the wharf about to board their aircraft, but casualties were nonetheless heavy. While these scenes were being played out on the harbour, the second attack group of three Zeros turned their attention to the aerodrome. Seven Allied aircraft had been standing there when the attack began: a RAAF Hudson bomber, a Dutch Lodestar bomber and a Dutch DC–3 cargo plane, and two American B–17E Flying Fortress and two B–24 Liberator bombers. One of the Liberators, carrying 33 passengers and crew, attempted to take off as the Zeros began their attack runs. It was promptly shot down into the sea in flames, and the other machines were all destroyed on the ground. Within fifteen minutes the Japanese pilots had fulfilled their mission and departed on a return course for their base. When about 80 kilometres north of Broome they encountered another Dutch DC–3, one of the last Allied aircraft to escape from Java, which happened to be carrying a large quantity of diamonds. This was also promptly shot down, raising the Zeros’ tally of Allied aircraft destroyed to 24. In fact, the pilot of this machine managed to crash-land on the beach at Carnot Bay, from where a number of its passengers were rescued by missionaries from Beagle Bay several days later. The evacuation of civilians from Java was conducted with inevitable haste and later, in the war cemetery at Broome, the graves of 29 unidentified victims of the raid gave solemn proof of the absence of records listing the names of the passengers embarked in Java. The Japanese attackers did not escape unscathed, having been forced to fly through a considerable volume of machine-gun and rifle fire from the flying boats and personnel on the shore. Most notable was a Dutch air force crewman who took up a machine-gun which had been removed from its mountings for repair and cradled it in his arms to engage any Zero which came within range, despite suffering burns to his arm supporting the gun’s barrel. One of the attackers was shot down and crashed, and damage from ground fire forced another to ditch near Roti Island while returning to base at Koepang in Timor (the pilot not being rescued until 21 March). Bullet holes were found in six of the seven aircraft which reached their base safely. At 10.45 a.m. on 20 March Broome’s aerodrome was the target of a raid by seven bombers. During this attack the north–south runway was cratered and rendered temporarily unusable by several explosions, a Stinson civil aircraft was burnt out, but there was only one fatal casualty recorded. Further attacks on 27 August 1942 and 16 August 1943 produced neither damage nor casualties.